It was pretty difficult to upstage Jon Snow and the return of "Game of Thrones" Sunday, but Tiger Woods managed to do it by returning to the throne of the Masters. But I am not just joining the chorus praising Woods for winning his fifth Masters at age 43 when many people thought he was finished two years ago because of the injuries he has had to endure. I am here to praise announcer Jim Nantz, who does all the big sports events at CBS and is best at announcing golf. He was exceptional Sunday, capturing every moment of Woods’ triumph and aftermath. I watched Woods’ play the final six holes at the gym where I was working out with the TV sound off and closed captioning on. I re-watched the final hours on my DVR just to hear Nantz speak the words that were written on the TV screen at the gym. He had me at his first four words after Woods’ short putt clinched his triumph. “The return to glory,” said Nantz, beautifully capturing the moment. When Woods left the green to embrace his son, Charlie, Nantz found just the right words again. “If that doesn’t bring a tear to your eye if you’re a parent, you’re not human,” said Nantz. CBS then replayed the scene of Woods embracing his late father Earl in 1997 after winning his first Masters with the scene of Woods embracing his son. Confession. I did cry while watching the hug at the gym and all over again when hearing Nantz’s words. I was a little surprised by my emotion because I haven’t been a big Woods fan since revelations about his personal life destroyed his marriage and his image before his game and body fell apart. Of course, Nantz and CBS weren’t about to dwell on those issues. They barely were addressed even peripherally. I suspect some people who stopped being a Woods fan years ago tried to hold back the tears and were unable to do so. 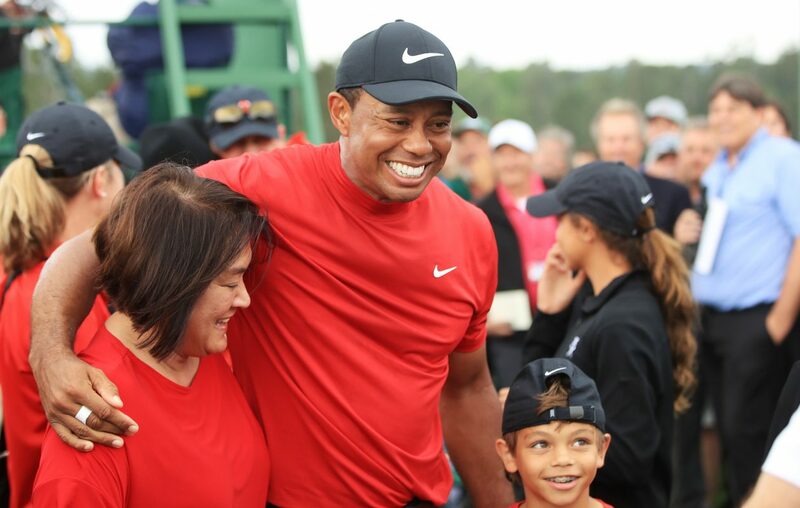 That I – and assuredly others – could be moved to tears despite some negative feelings about Woods illustrates what an incredible comeback story Woods had achieved and the willingness of sports fans to forgive heroes for mistakes that cause other people pain. Sunday also was a triumph for golf, which always benefits when Woods is in the hunt for a title. As CBS announcers repeatedly said Sunday, Woods was playing against many younger golfers he had inspired who finally got to see the older version of Woods play. The “old” Woods and the rainy weather in Buffalo undoubtedly also drove viewers to their TV sets. CBS’ coverage – which was moved to the morning because of predictions of nasty weather in Augusta, Ga. – hit a double-digit local rating on WIVB-TV (Channel 4) starting at 11 a.m. It gradually increased to a 15.3 rating by the time Woods had triumphed around 2:30 p.m. The final hour averaged a 14.2 rating. Those are incredible numbers for any sports event other than NFL football. To put it in further perspective, the much-publicized episode of the final season premiere of "Game of Thrones" Sunday had a 4.7 local rating. (Of course, HBO plays the episode multiple times during the week). The highest-rated prime time television entertainment program locally during the February sweeps was “The Big Bang Theory,” which averaged a 13.6 live rating. The Oscar telecast in February had a 13.5 live rating. Of course, the Woods story Sunday was better than any movie last year.